Jerry Taylor has withdrawn from this debate. For now, at least. You may each judge for yourselves†, but it seems to me, and apparently to some of my readers, that Jerry left standing my three central points: that cutting taxes on green energy, vehicles, infrastructure and efficiency appears to be 1) much like the broad tax cuts proposed by Cato's supply-siders, and hence, better for the economy than doing nothing; 2) far better than the tax and spend energy initiatives currently on the table (carbon tax-or-trade, subsidy, mandates) which were initially preferred by Jerry over tax cuts; and 3) similar to Cato's tuition tax credit and tax free health saving account proposals, as tax cutting strategies designed to strategically avert a big-gov disaster. If I am right about these points, then Cato – and many other think tanks on the right as well – should adopt the green energy tax cut proposal because it is philosophically consistent, economically beneficial, can help avert a big-gov disaster, and can help convince progressives (whose identity is evolving) to appreciate the benefits of tax cuts, and draw them away from pitfalls of tax and spend policies. So I issue an invitation, and a challenge – to Cato, AEI, Heritage, Americans for Tax Reform, Manhattan Institute, Atlas and many others. Let's build this proposal together. Let's use our time in the wilderness to save the wilderness, and capitalism too. But if you think I am wrong, then let's debate. If you think you can make a better case, then make it. But the truth is, as we have seen here in this debate, that just as cutting taxes beats doing nothing (or tax hikes) on the macro level, it does so on the sector level as well. If you disagree, bring it on. If you have courage in your convictions, that is. "Both you and Jerry Taylor make many wonderful points. I think Taylor is right that doing nothing is better than tax credits, subsidy, carbon tax. But it seems to me that he has misread your proposal, and much of this debate is a misunderstanding. He is reading it as a tax credit proposal, but it is not. Your point is a persuasive insight that I have not heard before, that tax cuts are entirely different from tax credits (or subsidy) in that government is simply getting out of the way vs throwing money at failure. Subsidy probably isn't even the right word for what you are describing. More an unburdening. And you probably are right that it could benefit the whole economy. Jerry is also right that more debt should be avoided, so if your proposal is to work, it will be critical how it is designed, so that it is at least revenue neutral. Nice to read a really good debate like this between libertarians." †Readers may find part I of the debate here, and part II here. So continues my debate with Jerry Taylor of the Cato Institute, and with it, my apostolic ministry of reason, to rededicate the hearts and minds of the Cato community to the cause of reduced taxes and government – for the sake of the general prosperity – wherever and whenever we can do this; specifically, through green energy tax cuts, here and now. I note that now, while Obama spends the weekend pondering the need to replace portions of his stimulus package with tax cuts, we have an opportune moment to start. There is much unproductive green energy stimulus being considered that would be well to replace with a productive green energy tax cut. I am in favor of the smallest government possible consistent with the job that government is charged with (protecting my right to life, liberty, and the pursuit of happiness). The size of government is defined by how much it spends and how much it regulates. Not by how much it taxes. I suspect that you don't agree. If not, ask yourself this - if we zeroed-out taxes for 2009 and found a way to borrow all the money necessary to meet current federal spending plans, would we have reduced the size of government to zero? No. Would we have reduced the size of government at all? No again. To argue to the contrary is to argue that putting your grocery bill on your credit card reduces your effective grocery bill to zero. The reality, of course, is that you simply decided to pay for today's groceries tomorrow ... but with interest. If you pay interest on your credit card, the size of your total bill went up, not down, by putting those groceries on the credit card. Why exactly do some libertarians believe that paying for your groceries with a credit card is somehow more "freedom enhancing" than paying with cash? Beats me. A stronger argument would be to pay with cash. At least you avoid paying the interest on the borrowed money. The inescapable reality is that - unless interest rates on Treasury Bills are zero - borrowing to pay for current spending increases the size of government relative to levying taxes to pay for current spending. Because my fundamental aim is to reduce the size of government, I prefer the latter to the former. Now, you are certainly correct that taxes harm economic growth. But borrowing to pay for spending programs simply transfers the economic harm of the taxes avoided from the present to the future. Hence, tax cuts are in a very real sense "borrowing" economic growth from the future. We are temporarily wealthier for it but we will later be poorer for it ... or future generations will be poorer for it if we die before the bills come due. Again, the only way to reduce the economic harm caused by taxation is to reduce spending. Borrowing will not do the trick. As far as economic stimulus is concerned, I don't think the best stimulus is a tax cut for the simple reason that a tax cut may not be used to purchase goods or services ... it might instead be saved. Now, that's fine with me (I'm not sold on the Keynesian stimulus argument anyway), but if government-induced stimulus is the objective, I don't think tax cuts will do the job as well as spending might. Again, however, I am not in favor of government-induced stimulus, so that's neither here nor there. So let's focus specifically on your green tax credit idea. First, since the tax cut you propose takes place in an era of deficit spending, you are by definition increasing the size of government with your tax cut. Second, your claim that tax credits do not entail deadweight losses is risible. The federal ethanol program is largely (but not entirely) founded upon the 51¢ blenders' tax credit and economists Harry de Gorter and David Just at Cornell find that the deadweight losses from that tax credit will total $28-49 billion by 2022. Deadweight losses likewise follow from the existing tax credits afforded the renewable energy industry, but how large they might be is unclear. Third, many of the energy sources you hope to favor with these tax cuts will not actually be helped because, as Tufts economist Gilbert Metcalf points out, their net tax burden at present is actually negative! Fourth, by using the tax code to favor some energy investments over others, you are again, by definition, expanding the size of government (hastening back to Friedman's definition that the size of government is defined by how much it spends AND how much it regulates). You are of course welcome to argue for market rigging exercises, but please, don't lecture me for being ideologically impure in the course of doing so. Fifth and finally, you may be right that your green energy tax cut idea is better than the Obama alternatives, but it is not Cato's job to figure out how best to maneuver on the existing political terrain and to use that insight to inform our arguments for second-best policy change. Our job is to argue for what policy OUGHT to be and let the political chips fall where they may. There are plenty of people in Washington who engage in this "argue for the best deal (or least bad deal) that we can get this year" approach. And there's nothing wrong with that. But there likewise needs to be someone or some institution out there arguing for best practice. Finally, a few points of clarification. I do not "extol the virtues" of a carbon tax. I am against a carbon tax. I do not extol the virtues of taxes in general. I prefer them to borrowing if the question is how to pay for our governmental bills (save for spending that will largely benefit future generations, in which case borrowing to some extent is defensible), but I more strongly prefer cutting spending and, correspondingly, cutting taxes as we go. One of the strangest features of debating you, Jerry, is the nagging feeling that you are really debating someone else. Honestly, I am feeling quite ignored. For your most devastating arguments bury nameless foes whose feckless views seem quite different from my own. Who are these people? Please name some names, cite some articles! Who are these "libertarians" who champion debt financing? 'Cause it sure as subsidized sugar ain't me, Jerry. Now, they may exist, but I don't know any libertarians currently arguing for debt financing. So unless I am mistaken, the real target of that remark is -- besides myself -- anyone arguing for tax cuts, including Chris Edwards, Richard Rahn, Daniel Mitchell and most of the tax policy team at Cato. Is that right? Because from what you say here, it is clear that you disagree with these gentlemen's most fundamental recommendations to cut taxes -- and not just when it comes to energy policy, as I supposed earlier. In order to make the argument that I, or any tax cut advocate, favor debt financing, you assume that any tax cut will lead to a tax revenue decline and hence more debt. 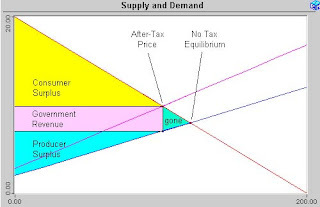 In order to make that assumption, you must ignore supply-side economics and the Laffer curve -- you never even mention either, but simply disregard these arguments as if I never raised them. But I do, often. I also specifically cite and rely on Chris Edwards' recent arguments that cutting present US corporate tax rates would boost the economy and raise overall tax revenues, in order to illustrate how a corporate green tax cut would enhance overall prosperity and could either increase overall tax revenue or be tax neutral, depending on how it is crafted. But you never bother to refute those key arguments, so they stand. Similarly you ignore but never refute my arguments that avoiding the big-gov disaster along with the spending cuts which are integral to my proposal, would, on top of revenue neutrality, shrink the size of government. Therefore, your claim that a green tax cut would "by definition increas[e] the size of government" (by forcing debt financing, I suppose you mean) simply fails because it does not refute the contrary arguments on the table. Jerry, if you ignore powerful, key arguments -- like supply-side theory, the Laffer curve, or your colleagues' recent tax research -- then I win the point and the debate. You must refute these arguments to prove my proposal leads to anything other than prosperity and less government. State clearly why the Laffer curve is a bunch of hooey, if that is what you think. Tell us why Chris is wrong, if you believe he is leading us to ruin. But as things stand – ignored but unrefuted – (a) your tax-cuts-lead-to-debt critique is fatally flawed in that it ignores that tax rates, if too high, may be cut while increasing tax revenue; (b) you therefore have not diminished my case that a green energy tax cut leads to general prosperity and less government. 1) Government size is defined by extent of spending and regulation, not taxation. Nonsense. First, taxes are regulations, often called IRS or Treasury regulations. Second, if taking our property under threat of violence is not the quintessential and second most potentially objectionable act of government, I don't know what is. You even define your libertarianism by quoting the Declaration of Independence, which ironically is the world's most famous complaint against tyrannical taxation. So I'll stand with Jefferson and the Continental Congress on this one, thank you. Taxes are government encroaching, and tax cuts removes that government encroachment -- possibly even permanently, without transferring it, depending on the shape of the applicable Laffer curve. I suspect many if not most libertarians would agree with this traditional American view. Your illustrative zero taxation thought experiment is fun but flawed. Just turn it on its head to see why: imagine a world with no (non-tax) regulations, with spending set at zero, but also with taxation at 100% of not only income, but any and all assets you own. According to you, government has then vanished. But destitute and homeless, I doubt you would feel government had shrunk much or developed a lighter touch. Taxation is just as much a measure of the burden of government as spending, regulation, debt or collective force. The application of this idea to the green tax cut debate is that carbon taxes, subsidies, mandates all increase government. A green tax cut is fundamentally different from these interferences, in that it actually reduces government and removes it from a particular endeavor, and so has fundamentally different economic characteristics (reduction of dead-weight loss, etc.). Revisiting your related claim that I am "by definition, expanding the size of government," I further reply that I am rather removing and shrinking government both by cutting taxes, and by displacing much more onerous big-gov tax and spend programs like carbon taxes, subsidies, and mandates. However, I am somewhat put out by the thought that you will probably just ignore this argument as you have the others. 2) "[T]he only way to reduce the economic harm caused by taxation is to reduce spending." Again, you are denying the Laffer curve here, which says that the harm caused by excessive taxation may be reduced by reducing rates, without reducing revenues. You are right that only spending cuts solve excessive spending -- we agree there -- but the reason is that no matter how much you tax, there is a maximum revenue that can be raised, period. Since we can't tax our way out of debt, we must ween the progressives away from spending policies, which is precisely what my proposal accomplishes. In other words, my proposal is a path to the spending reductions you yourself say are essential. 3) A tax cut is not the best stimulus because "a tax cut may not be used to purchase goods or services ... it might instead be saved." That possibility is really only true of personal income and property taxes and personal savings. The business tax cuts that are part of a green energy tax cut (sales, corporate income and capital gains tax cuts) are not subject to this objection and are well documented to encourage consumption, investment and general prosperity. 4) "[L]et's focus specifically on your green tax credit idea" ... "your claim that tax credits do not entail dead-weight losses is risible." Please, Jerry, read the title of my blog. It says tax cuts, not tax credits. Again you are ignoring what I actually say in order to set up a strawman. As I argued in my original remarks, these are NOT the same thing, and it makes a big difference.† Tax credits are a form of direct subsidy, a federal expenditure that allows a buyer to pay more for something than it is worth. This allows an unprofitable business to seem profitable. It allows the subsidization of failure. This is what YOU said is better than tax cuts: direct subsidy. I said politically directed subsidies, including tax credits, entail higher dead-weight loss. You are not attacking my argument here: you are attacking yours!! You are confirming that my argument is correct! No actual tax cut will allow this subsidization of failure. If you cut a sales tax or a corporate income tax, any products sold must still turn a profit on their own merit for the business to be viable. Tax cuts come into play only after a sale is made and a profit logged. In my proposal, there is no cash payment offered up front (i.e., tax credit/subsidy) that boosts the product above its true price. Only the green energy businesses that are profitable on their own merits will survive under my proposal, and the most profitable business models will receive the most in total tax cuts. Tax cuts promote success, while all other forms of subsidy, including tax credits, often subsidize failure. I fully expect corn ethanol will NOT survive in the Green Energy Tax Cut environment – including the elimination of existing subsidy tax credits – because the basic business model is unprofitable without subsidy, and the fuel requires more energy to produce than it yields. But that is a good thing, because the green technologies that thrive will be viable and productive. A related point is that the negative net tax burden that Prof. Metcalf reports is another way of describing the subsidization of failure through tax credit subsidies. Zero or low tax burden indicates a successful approach, but prolonged negative tax burden indicates an approach mired in failure. Which is in fact the direct subsidy approach you say is superior to green energy tax cuts. 5) As to your remark that I favor market rigging, my reply is I do not, that rather I favor lowering taxes where both possible and most likely to pass along the benefit to the whole economy. I favor eliminating tax-spend-regulate approaches, if externalities need to be taken into account, and replacing these with the most economically beneficial alternative: tax cuts. That is actually an effort to minimize market rigging. Since the public has clearly decided that such externalities exist and warrant support for alternative energy, it is arguably a form of market rigging on your part to insist there be no price adjustment. I believe in the face of a clear public decision such as the above, it is Cato's responsibility to promote the most economically beneficial option that meets the public's goals. This speaks to your point that Cato should promote best practice. A green energy tax cut is better practice than doing nothing, because it is more conducive to prosperity, because it shrinks government and better avoids the big-gov disaster, because it sets up an environment conducive to future broad tax and spending cuts. It is just as much best practice as tuition tax credits or tax-free health savings accounts, as tax cutting proposals designed to reduce overall government interference. Contrary to your tax cut critique, Cato's supply-siders are also pushing best practice, and there is no reason to think their recommendations would not work best for the green energy sector as well. If you think Cato is wrong to push these proposals, that Cato should limit itself to calling for the end to public schooling, for example, you should say so boldly. But I think Cato is on the right track in promoting strategic tax cuts as the best policy to promote prosperity and reduce harmful government interference in these areas. Cato needs to merely get on an intellectually consistent track with respect to energy policy in order to hit the best practice sweet spot. Lastly, if you say that Cato has no business arguing for second-best policy, why oh why then are your articles freighted with an elaborate hierarchy of second, third and fourth best policy choices – all far worse than tax cuts? In my view, your hierarchy not only is wrong, but gives aid and comfort to tax and spend advocates, for whose policies you should have not a single kind word. Looking at Patrick J. Michaels bang-on evisceration of the carbon tax (video on Cato home page today) I can't fathom why any Cato scholar would say that it is an effective price adjustment tool, when empirically it simply does not work and causes great harm. In addition to the unchallenged arguments noted above, you seem to have wisely conceded the point – and all underlying arguments – that green energy tax cuts are superior to a carbon tax, cap-and-trade or subsidy. Perhaps your argument about the dead-weight loss of tax credit subsidies for ethanol was an attempt to refute my arguments, but I trust you can see now how it rather refutes yours. Further, beyond your flawed tax cuts = debt critique, your response does not directly challenged my central arguments that green energy tax cuts, like all tax cuts, would tend to enhance prosperity more than doing nothing;†† would help reduce spending by avoiding a big-gov disaster (i.e., the tax-and-spend approach you preferred and have apparently abandoned); and would create conditions conducive to future spending and tax cuts, as we ween progressives away from the big-gov trough. Nor do you challenge the idea that strategic tax cuts in the energy sector would act like a broad tax cut for the whole economy, as the benefit of the cut is passed on in reduced energy prices. I very much appreciate the exchange of ideas with thoughtful individuals like yourself and Randal. I don't mind sharp, challenging arguments, I enjoy a tough debate, and hope you feel the same. I sincerely hope you are able to respond, and fill in the gaps in your argument – or even better, are ready to concede a few points, and make some changes for the better in Cato's energy policy. I am also very curious to hear from the Cato scholars whose views you directly contradict: the supply-siders, Edwards, Rahn, Mitchell, et al., and the health and education reform advocates. Do they see the contradictions? Do they agree with your tax-cuts-lead-to-debt critique? Do they agree with me that tax cuts remove government, and so are economically different and superior to any of the tax-and-spend interventions you initially preferred? Do they think that the approaching big-gov energy disaster is somehow different from the education and health care disasters, and so requires a different logic and response? †As I said in my original remarks: "Most subsidies, even tax credits, can allow unprofitable companies to seem profitable. Tax cuts, however, cannot make the unprofitable profitable, so only real solutions will survive. [I]f broadly applied, tax [cuts] will allow the market, not the government, to pick the specific winners among clean technologies." †† You at least partially admit green energy tax cuts would promote prosperity when you agree that taxes harm prosperity.